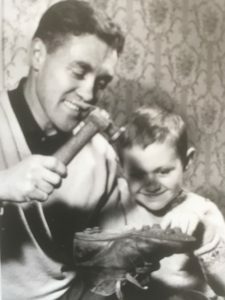 In Glasgow-speak a ‘Wee Barra’ is usually used to refer to a small person who people like, Bobby Collins might not have been liked by all, and certainly not by all opponents or opposition fans. But he was the type of player you wanted on your team. Collins can truly be said to have had two football careers. The first came in Scotland when he started as a tricky and elusive winger or inside-right with Celtic. 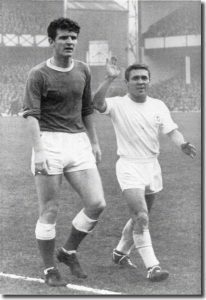 Then, on moving to England he became, first with Everton and later and more famously at Leeds, an abrasive midfield general and prompter and a non-shirker of the most physical battles despite his diminutive size. At Leeds he was very much Don Revie’s right-hand man and he helped guide and form a team that became giants of the English game. The likes of Billy Bremner, Eddie Gray, Peter Lorimer, Paul Reaney and Terry Cooper all developed their game while playing alongside Collins, who led by example and was as tough in training as he was on the pitch on matchdays. Born in Glasgow In 1931, Collins was the eldest of six children He worked as a miner and a cobbler from the age of 14. One of the advantages of working down the mine, he would later admit, was that it meant he avoided conscription. As a youngster he was a fan of Third Lanark and would often squeeze under the fence to watch them play. Whilst playing for local team Pollok FC – a club that produced numerous players who went on to have successful careers both in Scotland and England, Collins was scouted by a number of teams. Everton were quickest off the mark offering the Southside Glaswegians £1,000 for the youngster. The deal seemed set to go though until the player got wind of interest from Celtic. and instead signed a part-time contract with them at £8 per week. Collins was still working as an apprentice cobbler (he would later say ‘Football was a wonderful life but I found working outside the game interesting and challenging too’) when he made his Celtic debut. He was thrown in at the deep end, being given the start in a 1949 Scottish League cup final old-firm clash with Rangers in front of 70,000 fans. He responded well having a fine game in a 3-2 win. 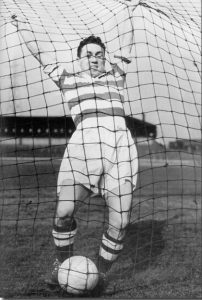 The tiny (5ft 3in) terrier soon became a regular in the Celtic first team and in the 1950-51 season scored 15 goals in 27 league games, including a hat-trick against Falkirk. This earned the notice of the national selectors and he soon received his first Scottish cap. 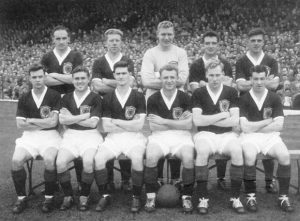 Collins was forced to withdraw through injury when originally chosen for Scotland but he made his debut in the October 1950 match with Wales in Cardiff, creating a goal for Billy Liddell in a 3-1 win. He stayed in the team for the next two matches but the second of these was a home defeat by Austria which led to big changes in the Scottish set-up. The Celtic man was one of the casualties of this and wasn’t chosen for the national team again for almost five years. Collins’ early years at Celtic saw the club continue to struggle, at least by their own high standards as they had since the resumption of football after the Second World War. But in 1951 he was ever-present in the run to the Scottish Cup final and played in the 1-0 win over Motherwell in front of 132,000 fans. Eventually, Celtic pulled out of their slump – at least for one season – and it was Collins, along with Jock Stein, leading the way. 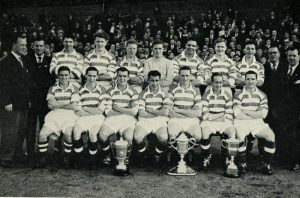 The 1953-54 season was when the ‘golden years’ returned to the club with a league and Cup double. Although somewhat scandalously, Collins was left out of the team for the Scottish Cup final success over Aberdeen. The move to leave Collins out for the final was just one of many odd decisions being taken by the men in charge at Celtic Park. Back-to-back League cup wins in 1956 and 1957 seem scant reward for a squad packed with talent. 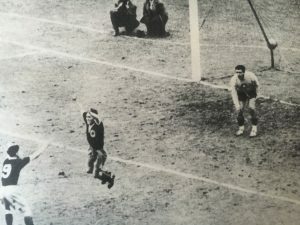 The 1955 Scottish Cup final is a case in point; Celtic drew the first game with Clyde but Collins was left out of the replay for ‘an undignified charging of the Clyde goalkeeper’. The team duly lost the return. The 1957 Scottish League Cup final win over Rangers was particularly memorable. Celtic went in at half-time with a 2-0 lead and few could predict what would happen in the second period. A third goal seemed to put the game out of reach until their opponents pulled one back. But then, with the Rangers defence opening up so much that ‘you could have driven a circus through it’ according to one observer Celtic scored four more times to complete an amazing 7-1 success. This seemed to set the team up for a sustained return to the great days, and with Collins as a key component. By this time he was also back in favour with Scotland. He had been restored to the national side in 1955 and in 1958 he appeared in all of his national team’s three matches at the World Cup in Sweden. 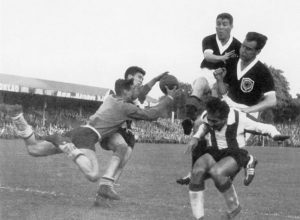 The Scots failed to impress, drawing with Yugoslavia before suffering defeats by Paraguay (where Collins scored) and France. But in September 1958 the ‘Wee Barra’ was gone, sold to Everton for £23,500. The move was, in all likelihood, made for financial reasons although this was never made clear. There was some talk that the money received paid for the new floodlights at Celtic Park. What was clear was that Collins wasn’t happy to be sold. But unlike now, players had little say in when or where they were tansferred. So, after 220 games and 80 goals the bags were packed and he was off to England. When Collins moved to Everton, former Scottish amateur international Ian Buchan was ‘chief coach’ (he was never given the title of Manager). But he hardly had time to unpack before Buchan’s disastrous spell in charge came to an end and Johnny Carey was installed as the new man at the helm. Under Carey, Collins was a key figure as the club looked to return to better times. 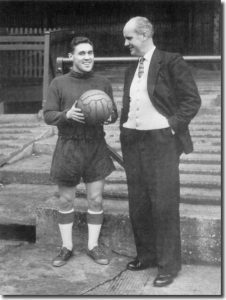 After a couple of seasons of finishing in the bottom half (in the second of which Collins finished top scorer), the arrival of Roy Vernon and others saw the Toffees jump up the table and finish 5th in 1960-61, their highest post-war finish. This wasn’t good enough for Chairman John Moores who sacked Johnny Carey – memorably in the back of a taxi. 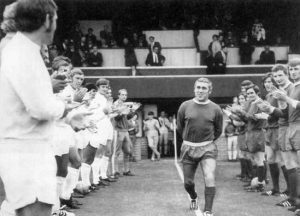 Carey’s successor was Harry Catterick and under him they improved again in 1961-62 to finish 4th, though Collins started just 19 games and in March 1962 Everton accepted a bid of £25,000 from Don Revie of Leeds United and the Scot left Goodison Park for Elland Road. At 31, many would suggest that a player is in the twilight of his career. But for Collins, the best was yet to come. When he joined Leeds the club were battling to avoid relegation from the 2nd Division and rooted to the foot of the table but with his help they managed to finish 19th and retain their second tier status. Revie made Collins skipper and he helped nurture the young group the manager had brought together. In the 1962-63 season they jumped to 5th in the table and a season later they were champions and promoted to the top flight. Colllins’ style of play had become more combative but no less effective. For their debut season in the top flight there was no time for consolidation. Leeds came close to the elusive double, as close as it is possible to get without winning anything. They finished runners-up to Manchester United in a tight race for the title and lost in extra-time to Liverpool in the FA Cup final. The season was a personal triumph for Collins. He was recalled to the Scotland team, winning the last of his 31 caps 10 years after the first in the 1-1 World Cup qualifier draw against Poland in Chorzow and was also voted Footballer of the Year by the Football Writers Association. There was no doubt that he led a young Leeds side by example, goading opponents and showing a fierce approach on the pitch. Teammate Eddie Gray would later say of him; “To an extent, the respect he had from the younger players at Leeds was based not just on his skill and his record in the game, but also on the fear factor. As soon as you saw his finger go up pointing at someone, you knew that person was in trouble”. There was some unrest between Collins and Revie during the summer of 1965 as the Leeds manager pursued Blackpool’s Alan Ball. But a talk between the two cleared the air and the Scot continued to lead the young side as they looked to build on their success of the previous campaign. Sadly, a Fairs Cup game in September 1965 brought his season to an early almost end. A vicious challenge by Torino left-back Poletti saw Collins stretchered off. Leeds returned home from Italy having secured the goalless draw needed to secure their place in the next round. But they left their skipper behind in a Turin hospital after he’d had a pin inserted in his broken thigh. The tackle, which none other than Billy Bremner called; ‘Just about the worst I have ever seen’, kept Collins out of action until the final match of the season, against Manchester United. 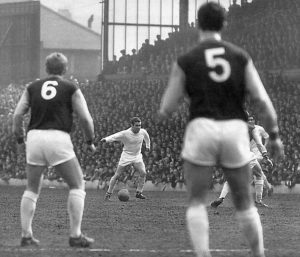 The skipper had played two reserve games in four days and Revie asked if he was ready to return to the side for a match Leeds needed a point from to guarantee the runners up spot behind Liverpool. 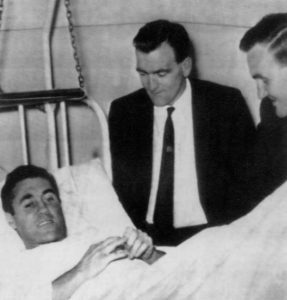 Revie asked Collins if he was ready to return. “I’ll play if you want me”, came the reply. Collins played, and made the Leeds equaliser that saw the team secure second spot for the second season running. By the start of the 1966-67 season Bremner had taken over as captain and Johnny Giles had replaced Collins as his midfield partner. 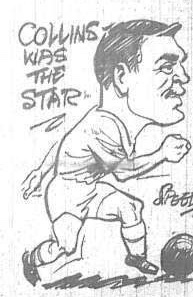 This left no room for the former skipper and he left Leeds for Bury on a free transfer in February 1967. He spent just over two years at Gigg Lane, scoring 5 goals in 75 games. Next he returned to Scotland, spending some time at Greenock Morton whilst also working as a scout for Revie. It was in the latter role that he recommended Joe Jordan to Leeds who signed him after just eight games for the Scottish club, for £15,000. He next joined Shamrock Rovers and then, as his playing time diminished he switched from player to player-coach then coach and manager. During this time he took on roles with Oldham Athletic, Huddersfield Town, Hull City, Blackpool and Barnsley. 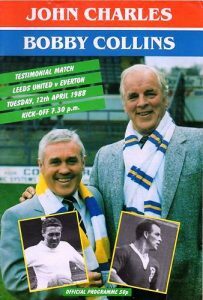 In April 1988, Leeds held a joint testimonial for Collins and another former-great, John Charles. The match was between a Leeds All-Star XI and League Champions (and Collins’s former club) Everton. The Leeds line-up included Michel Platini, Kenny Dalglish, Gaetano Scirea and Ian Rush, and Rush scored a hat-trick as the home side ran out 3-2 winners in front of a disappointing crowd of 13,671. Collins was diagnosed with Alzheimer’s Disease in 2002 and passed away in 2014 aged 82. 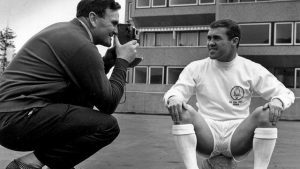 Despite the undoubted successes at Celtic and, to a lesser extent, Everton, it is his time at Leeds that Bobby Collins is clearly best-remembered for. 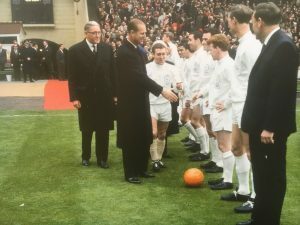 Whilst Don Revie is rightly thought of as the brains behind the Leeds’ rise to become a prominent team at the game;s top level, Collins was clearly at its heart. Revie would later say of his captain; “He is the perfect example of what we in the game call a professional’s professional”. 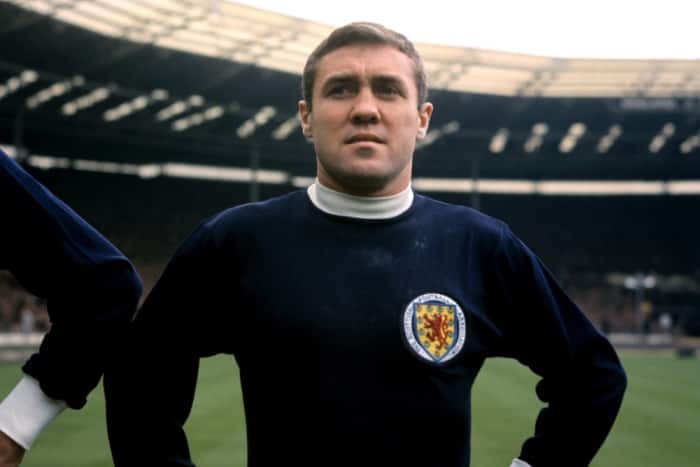 Billy Bremner, who idolised Collins during his formative years and then got to play alongside his hero, said; “Bobby Collins was the best professional I have ever known. “I learned many great things from Bobby, not the least being able to take the knocks as well as hand them out, and always play the game as a man. 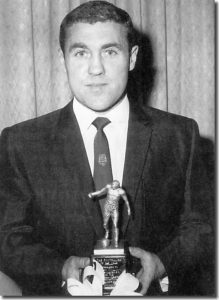 “They say that one man does not make a team – but Bobby Collins came nearer to doing it than anyone I have ever seen on a football field”.